Along with blackjack, Live Roulette is undoubtedly one of the most popular table games out there. 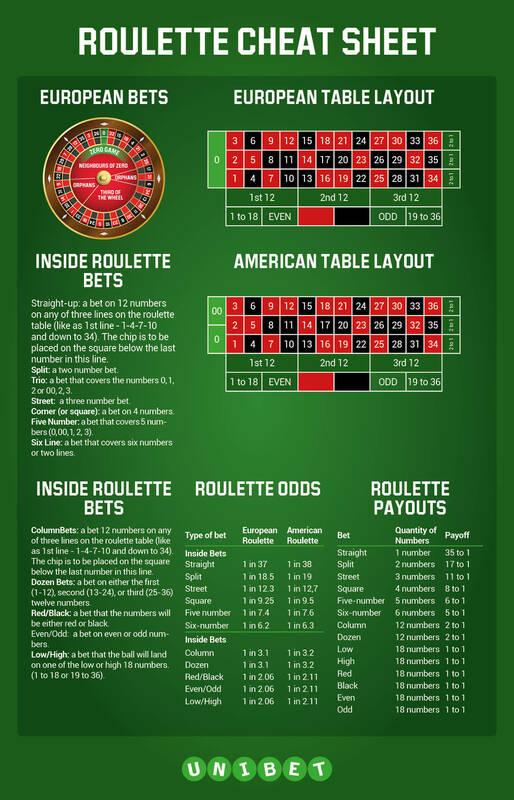 If you’re new to online roulette, fret no more as we have got this covered for you with this handy quite. If you’ve never laid your eyes on a roulette table before, this might appear daunting at first. Once we have explained it to you, you can rest assured that Live Roulette is a fairly easy game to play and comprehend with the added advantage of a strong fun factor. Following the standard roulette layout found at most casinos, you kick off the game by placing a bet on any single number (straight up), a combination of numbers, red or black, odd or even on any number between 1 and 36 and 0 and 00 depending on which type of online roulette game you opt for. Every online roulette game starts when the dealer spins the wheel in one direction whilst rolling a small ball along the inner edge of the wheel in the opposite direction. The ball will eventually fall into one of the many slots on the wheel. The number it falls in will be declared the winning of the game. The inside bets are placed on the inner field of the table, on the numbers 0 up to 36. There are 5 types of inside bets: Straight, Split, Street of Three line, Corner and Six line. Straight: a bet on a single number by placing a chip on the box that corresponds to that number. Split: a bet on two adjacent numbers, horizontally or vertically, by placing a chip on the line between the two adjacent boxes. Street of Three Line: a bet on a row of three numbers on a single horizontal line by placing a chip on the outer line of the number on the far left of the three numbers. Corner: a bet on four numbers that form a square, by placing a chip on the cross between the four numbers. Six Line: a bet on 6 adjacent numbers at the same time. If you want to bet on 1-6 for example, you place a chip on the T-junction on the far left between the 1 and the 4. Outside bets are placed on the boxes around the inner field with the numbers 1 to 36. Basically there are 5 options to place an outside bet: Column, Dozen, High or Low, Red or Black and Odd or Even. Column Bet: a bet on one of the three vertical rows (left, middle, right) by placing a chip in the box at the bottom of the row, you then bet 12 numbers at the same time. Dozen Bet: a bet on 12 numbers in three consecutive rows, by placing a chip in one of the following areas: 1ste 12, 2nd 12, 3rd 12. High or Low bets: a bet on the high numbers (19-36) or the low numbers (1-18). Red or Black: a bet on a colour (red or black) instead of on a number. Odd or Even: a bet on odd or even numbers. One of the key decisions you need to make when playing online roulette is to decide on whether you want to try your hand at European or American Roulette. One major difference between the two is that the American roulette wheel has 2 zeroes on the cylinder which gives you a bigger advantage in online casino. One of the key differences between American and European Roulette is that the American roulette wheel has 2 zeroes on the cylinder which gives you a bigger advantage in online casino. In total there are 38 pockets on the American roulette wheel, ranging from 0 to 36 plus the additional 00 number – 18 of these pockets are red while 18 are black and the two remaining slots with the numbers 0 and 00 are green. The European roulette wheel has on the other hand, a single 0 which makes it a great choice for those who want to offset the effect of variance. The zero slot is green here while the other 36 numbers are split in half, with 18 being black and the rest red. Unibet has a wide range of online roulette games but if you fancy the full authentic live casino experience then Live Roulette is the right game for you.